Clocking in at a tick under 22 minutes, the humorously offbeat That’s Opportunity Knocking, written and directed by Charles Pelletier, asks, What could go wrong in a simple home robbery? The answer is, tons. Acknowledging that everyone, robbers, robbees, an otherwise innocent – and heavily sedated roommate – have various motivations and desires, not to mention personality quirks, the film is more an analysis of the context of a robbery and less of the particulars of the robbery itself. Seeing them on the street, you wouldn’t associate Merit (Moronai Kanekoa) and Rob (Satchel Andre) with your average crooks. Merit went to Stanford, studied political philosophy, and got booted out of ROTC for being part of Occupy Wall Street. Explaining the rationale of the upcoming robbery to Rob – 1% of the population controls 50% of the wealth – he seems to be the brains of the operation. Rob carries a red purse. In the first few moments, as they walk down a quiet residential street, Rob says he’s never done this before. You wonder, hmmm, him, the purse, another dude; but, no – it’s not about sexual awakening, it’s about, well, it’s about an opportunity that’s a-knocking. The story’s comic premise is based on obstacles that become these opportunities. Obstacle one. Merit and Rob stole the purse from Chelsea (Charlotte Gulezian), an artist and poet, who was listening to her roommate Tim (Thomas Anawalt) perform at a club. When they come home early – robbery interruptus – Merit and Rob hide in the bathroom. There they remain until Chelsea and Tim, who has a day job in a hardware store called The Happy Hammer, which is what he’d love to do to Chelsea, viz, nail her, head to the sack. Obstacle two. As they recommence their ransacking, Merit with his deluxe suitcase, Rob with his more appropriate sack, Wally (C. Stephen Foster) comes out of his bedroom. Wally’s just returned from a sojourn in a mental hospital. After four unsuccessful suicide attempts and after asking Chelsea to marry him after she slept with him as well, he doesn’t mind if they kill him. After Merit and Rob debate Rob’s street cred (No one fears you, dude, even with your gun), the suddenly resourceful Wally offers to join the gang. He even directs them to the Ming vases, the vintage Stratocaster guitar, and some cash. In other words, everyone scores, even Tim. The keen ensemble performances make this funny production hilarious. Kane and Kanekoa are perfect as the disenfranchised Everymen who resort to crime. Kane, nervous at the beginning, becomes, or could have become a ruthless killer at the end. Kanekoa goes the other direction: motivated by a righteous Robin Hood political philosophy, he quickly realizes he’s not cut out for this line of work. Anawalt and Gulezian are very well cast as otherwise flirty roommates that, with a beer or two under their belts, decide to go for it. Anawalt’s say-anything-to-get-laid pleas are especially spot on. And Foster’s Wally fantastically goes from pitifully doped up prospectless moper to incandescent born-again Edward G. Robinson as he seizes on his dream to be a movie gangster. The script and performances are very good, but the best thing about this short film is the realization of how normal each character seems. We all know people like this. Whereas before the economic, political, and social situation went and has remained sideways, the behavior of Merit and Rob would have seemed unlikely, if not inconceivable. Now, though, in a different world, it’s anything goes. In other words, when opportunity knocks, you damn well better answer the door. 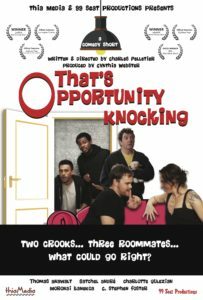 That’s Opportunity Knocking is a fun comedy that doesn’t take itself too seriously. It is light-hearted and entertaining meaning almost anyone can sit down and enjoy it. Rob and Merrit are two desperate men who are struggling to find work and resorting to robbing an apartment. The reluctant criminals use keys from a purse they snatched earlier. They begin to grab the loot, unfortunately for them the girl returns to her apartment with her roommate looking for her missing purse. This is only the start of the problems for the pair of robbers as Tim, the roommate, has plans of his own with Chelsea, the purse owner, and they don’t look to be leaving the apartment anytime soon. Writer and director Charles Pelletier has given us a fun, witty and intelligent script that has been well planned out and executed. The dialogue keeps a constant flow delivering some great comedy. I loved the chemistry between Rob and Merrit, they share some great scenes and dialogue together, it seems natural between the two and is the source of much of the laughs. Not to be outdone, Chelsea and Tim have some great scenes together, You do believe that these two have lived together for some time and again share some excellent dialogue. In the final third of the short we are introduced to Wally who really helps to elevate the comedy. This psychotic character was a great game changer and a nice addition. He really mixes it up with Rob and Merrit and helps to end this film on a high. I liked his energetic machine gun as he acted out his favorite gangster movies. This 22 minute short felt more like a sitcom in the apartment setting, making a feeling of familiarity that really helped to set the scene. It is the little things what count, and Charles manages to cover all of these minor details that separate a good short from a great one. Some of the best shots coming in the cramped bathroom with Rob and Merrit sitting in the bath tub, shots that are not easy to do in such cramped conditions but these are expertly done. Speaking of this movie having a sitcom feel, even the music, which fits the short perfectly, has that same sitcom vibe to it. The final track being very reminiscent of a theme tune which fits in nicely. Charles Pelletier, also providing the original music, clearly is multi-talented man. Giving us a very light-hearted and entertaining short film makes it extremely easy to watch. The dialogue is witty, natural and intelligent. This scenes are well-timed which gives us an excellent pace throughout and make it easy to follow. Satchel André plays Rob, one of the robbers. He puts in an extremely solid performance. I loved the chemistry he had with Merrit (Moronai Kanekoa) which really makes this short work so well. He seems to be a natural and is good to watch on-screen. I previously mentioned his excellent scene in the bath tub with Merrit, but his performance is of a high standard from start to finish. Moronai Kanekoa plays Merrit, the other robber in this short. Moronai matches Satchel with his performance. These two worked very well together even though the were completely different characters. Moronai does not look like your typical off-the-grid political activist type, but we just go along with it because he tells us. He is a fantastic character who Rob describes as a “Hopeless Wussy”. He has some fantastic goofyness in the character somewhere. Charlotte Gulezian plays Chelsea, the girl who had her purse stolen and lives in the apartment they are robbing. Charlotte is a strong actor and shares some excellent scenes and dialogue with Tim (Thomas Anawalt). I loved her acting, she was fantastic especially her facial expressions, I think sometimes they are more important than delivering the actual lines and Charlotte does this very well. Thomas Anawalt plays Tim, one of Chelsea’s roommates. Thomas has one goal in his mind, getting some action from Chelsea. I liked the character of Tim, Thomas is again another strong member of the cast. He seems to have a bit of a Seth Rogan about him, not necessarily in his look, it was more the dialogue, I wasn’t sure if it was what he was saying or the way in which he delivery but it worked and it was entertaining to watch. C. Stephen Foster plays Wally, the other roommate. Wally is mentioned throughout the short but only appears in the final third. Wally we learn has been institutionalized, but has only just returned home. C. Stephen Foster gives us an exceptional performance as Wally. He completely embodies the character and is very enthusiastic playing him. I feel like he really took this short up a notch when he was on-screen. This was a great short film. That’s Opportunity Knocking benefits from some brilliant writing which is perfectly performed by an extremely strong cast. This is a brilliant comedy that almost anyone can enjoy. This is self-contained with a satisfying ending that ties everything up and leaves you very satisfied. This is very easy viewing and comes highly recommended. The crazy thing is this is loosely based on a true story!